A spectacular dining set from about 1925 includes a table with three leaves and six chairs with new upholstery. Crafted by "Rockford Furniture of Rockford, Ill," this grand antique furniture was made for a summer mansion on Green Lake, Wisconsin. The restored finish is in excellent condition on this palatial American made ensemble. 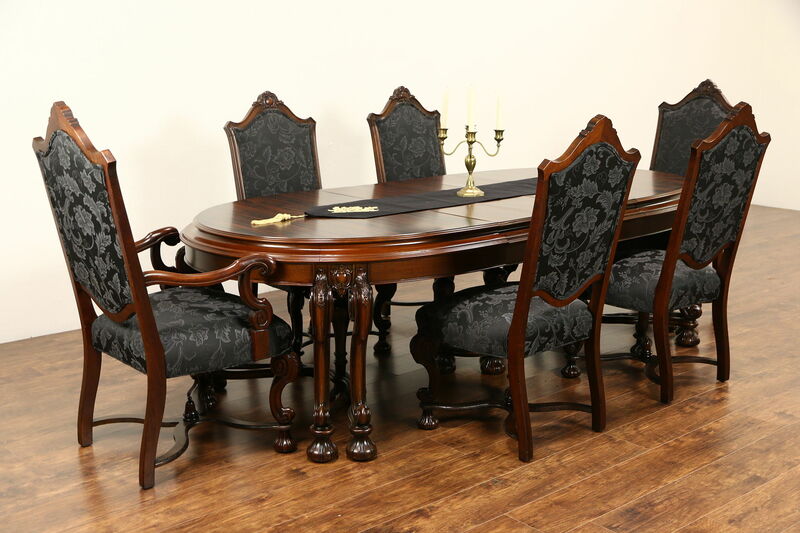 Richly carved of walnut, the table top is genuine Macassar Ebony. Three original leaves are 11" wide, and are slightly warped so they do not fit together perfectly at the edges, see photos. A four leg center pedestal supports the oval top when the table is opened. Measurements are 48" wide, 30" tall, legroom is 24" underneath and length when closed is 71," with all three leaves in place, length is 8' 8" overall. Six chairs are reglued to be tight and strong to serve another generation. The trestle base with center finial adds strength to the robust frames. Large and comfortable, new padding is soft and supportive. Four side chairs measure 24" wide, 26" deep, 46" tall and seats are 20" high and 18" deep. The arm chairs are 26" wide, 27" deep, 47 1/2" tall and the seat is 20" high and 20" deep.